Nathaniel Hone (Lugt 2793). Private collection (sale, Sotheby's, London, 4 December 1969, no. 79); Yvonne Tan Bunzl; NGA purchase in 1971. Old Master Drawings, Yvonne Tan Bunzl, London, 1971, no. 13. NGA Recent Acquisitions 1974, no. 24A (as Attributed to Sebastiano del Piombo). Disegni di Tiziano e della sua cerchia, Cini Foundation, Venice, 1976, no. 54 (as Venetian artist, c. 1520)(Konrad Oberhuber). "The Radiance of Apollo: the Italian Renaissance and Greece", National Gallery and Alexandros Soutzos Museum, Athens, 2003-2004, no. 1413. Saccomani, Elisabetta. "Ancora su Domenico Campagnola: Una questione controversa." Arte veneta 33, 1979: 44, 47, 48, 49, notes 23 & 27, fig. 8. 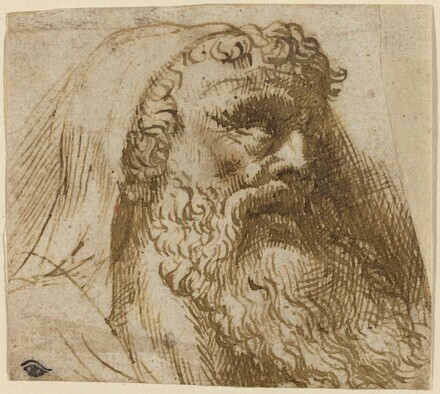 Wethey, Harold E. Titian and His Drawings with Reference to Giorgione and Some Close Contemporaries. Princeton, 1987: 182, no. A-8, fig. 193.